Impressive results for Little Egypt Golf Cars. 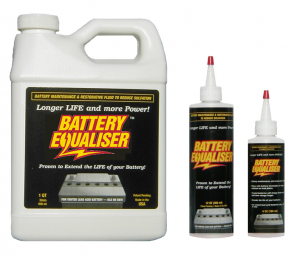 I have tested Battery Equalizer and had some impressive results. I was testing 2009 EZGO RXV cars with Trojan T-1260 batteries. I have 30 of these cars in inventory. We had not used them at all when I started testing in the Spring. Initially we got discharge readings in the 80 minute range. I treated the batteries with your product and continued discharge testing. The first 4 discharges showed no change. Starting with the fifth discharge I saw dramatic gains in discharge times. After 8 discharges the batteries peaked at 101 minutes. We subsequently put the vehicles in use in our tournament fleet. I recently tested one of the cars which had not been treated with Battery Equaliser and got the same 80 minute discharge time as I did in the Spring. Since the cars have now been cycled numerous times I believe it is a safe assumption that your product helped the batteries significantly, over and above the normal improvement you would see in new batteries after sufficient cycles of operation. I plan to review my fleet needs for the upcoming year and determine the best use of your product. I will keep testing in other battery scenarios as well. President, Little Egypt Golf Cars,Ltd.